The council had asked the group to put on the event as part of Pride festival celebrations. The group said the response to these events in the past has "always been entirely positive". DUN LAOGHAIRE-RATHDOWN County Council has said it made the decision to cancel a drag storytelling event at a library due to degrading comments made online about the performers and staff. 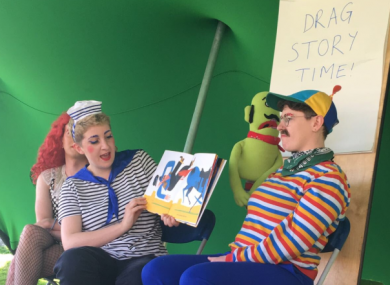 The family event was being organised by drag collective Glitter Hole, which has run Drag Story Time events for children three times previously at various locations, including at the International Literary Festival Dublin last summer. The group said the response to these events has “always been entirely positive”. This morning Glitter Hole criticised the council’s initial statement about the cancellation of the event, accusing the council of labeling “the queer people the risk in this scenario”. The group said the reason for the cancellation was health and safety after a barrage of hateful comments directed at it over the weekend, but the council’s statement last night made no reference to this. Instead, it cited a review of the age appropriateness of the event as the reason. However in a new statement following queries from TheJournal.ie, the council said it wanted to clarify that the cancellation was “due to our significant concern at the high level of degrading, inappropriate comments on social media about the performers and library staff”. Glitter Hole said it was contacted by the council last month and asked to put on one of its drag storytelling performances on 26 June for this year’s Pride festival. It was due to take place at Deansgrange Library. It said over the past weekend it had been “inundated with extremely violent homophobia from a frighteningly large group of bigots who believe that a few drag queens reading books to children amounts to child abuse”. The library decided that the event was a safety risk, which we accepted given the scale and gravity of the vitriol that was being spewed on twitter. However, the statement issued by DLR last night cites ‘age appropriateness’ as their reason for cancellation. Glitter Hole said the implication of this statement was that the content of its drag shows for adults had deemed its performers inappropriate children’s storytellers. “There is no mention in this statement of the safety concerns for the performers or audience of the event due to the ongoing abuse we’re receiving online,” the group’s statement said this morning. Email “Council says drag storytelling event cancelled due to 'degrading' online comments ”. Feedback on “Council says drag storytelling event cancelled due to 'degrading' online comments ”.